Harold "Prince Hal" Newhouser (May 20, 1921 – November 10, 1998) was an American former professional baseball player. In Major League Baseball (MLB), he pitched 17 seasons on the Detroit Tigers and Cleveland Indians, from 1939 through 1955. 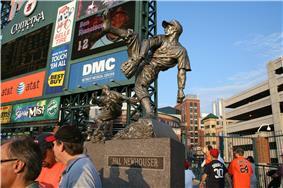 Newhouser was an All-Star for six seasons, and was considered to be the most dominating pitcher of the World War II era of baseball, winning a pitcher's triple crown for the Tigers in 1945. After his retirement from baseball, Newhouser was away from baseball for 20 years while he served as a bank vice president. He later worked as a scout for several MLB teams. While scouting for the Houston Astros, he was angered when the team did not listen to his recommendation to draft Derek Jeter and instead picked Phil Nevin. He quit shortly after. Newhouser was inducted into the National Baseball Hall of Fame in 1992. He died several years later in a Michigan hospital. By the 1945 season, NewHouser had been selected for three consecutive AL All-Star teams. The 1945 All-Star Game was cancelled on April 24 because of travel restrictions and seven out of eight scheduled interleague games were played in place of the All-Star Game on July 9 and 10 to support the American Red Cross and War Relief fund. Newhouser became the first pitcher to repeat as MVP that season and helped the team win the World Series. He won the pitcher's Triple Crown, leading the AL in wins (25, against nine losses), ERA (1.81) and strikeouts (212). He also led the league in innings pitched, games started, complete games and shutouts. Newhouser pitched four innings of relief on the season's final day as Detroit rallied for the pennant. Newhouser won the second The Sporting News Pitcher of the Year Award. He became the youngest player (24) to win the award in two consecutive years. In that year's World Series, Newhouser won two games, including a complete-game victory in the deciding seventh game. As a scout with the Orioles, Newhouser discovered Milt Pappas. Pappas was a Detroit high schooler named who went on to win 209 games in his career — two more than Newhouser did. He also signed Dean Chance to the Orioles. Chance later won a Cy Young Award after leaving the team. ^ a b c Goldstein, Richard (November 11, 1998). 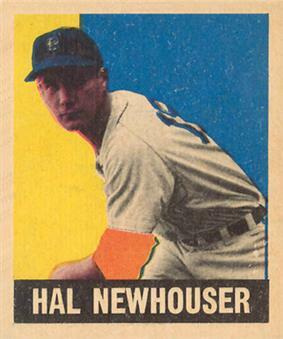 "Hal Newhouser, 77, a Hall of Fame pitcher". ^ "Hall of Famer Newhouser dies". ^ Buster Olney (August 23, 2004). "Jeter: Dynasty's child". ^ Nightengale, Bob (April 1, 2014). "Hal Newhouser, Phil Nevin and how Derek Jeter almost didn't become a Yankee". ^ Wancho, Joseph, et al (eds.) (2014). Pitching to the Pennant: The 1954 Cleveland Indians. ^ Holtzman, Jerome (August 4, 1992). "Constant change keeps Hall Of Fame up to date". ^ Olney, Buster. "Jeter: Dynasty's child".